Hello! Hope y'all are having a great Saturday! I played in a couple of SCS challenge this morning! Yay! 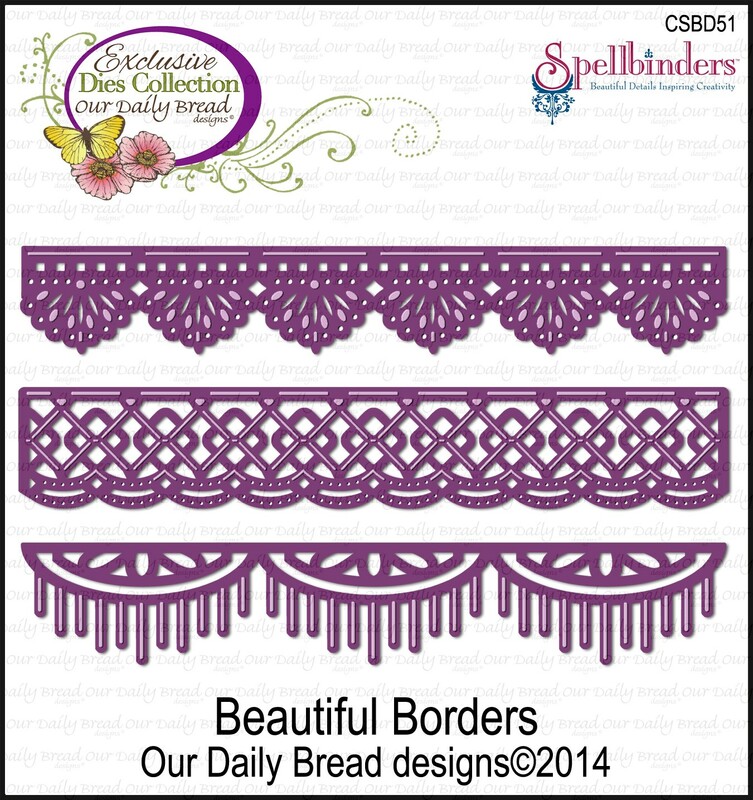 Today's Inspiration Challenge using an Inchie Inspiration Board on Pinterest. 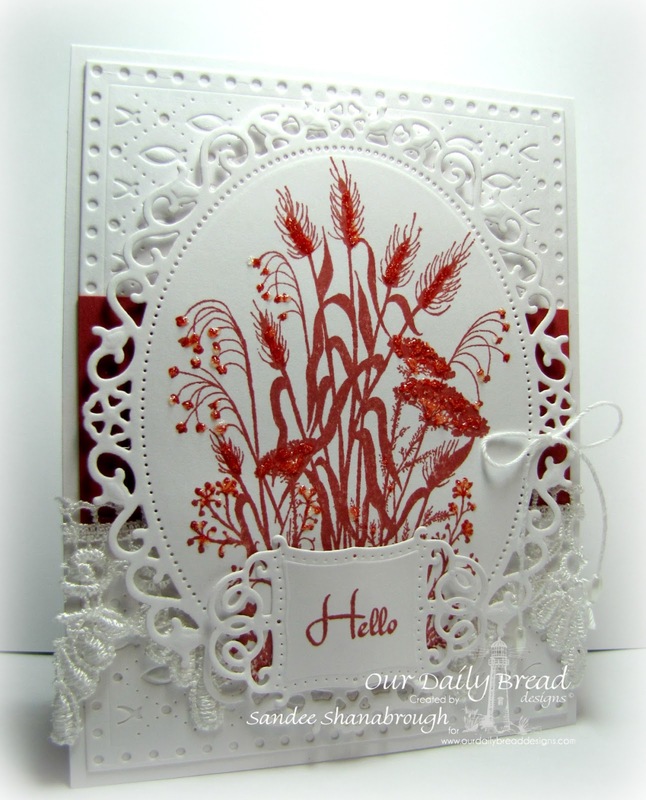 The other is this week's Ways to Use It Challenge to use Buttons and Lace! No stamping on this card. I cut inchie squares from chipboard and inchies and pieces from ODBD Blushing Roses Paper Collection and ODBD Soulful Stitches Paper Collections. I adhered the paper onto the chipboard with gel medium, painted the edges and lightly all over with a beige colored distress paint, and then added all my elements. Lace, a button, pearls strands. A heart from the ODBD Ornate Hearts Dies. 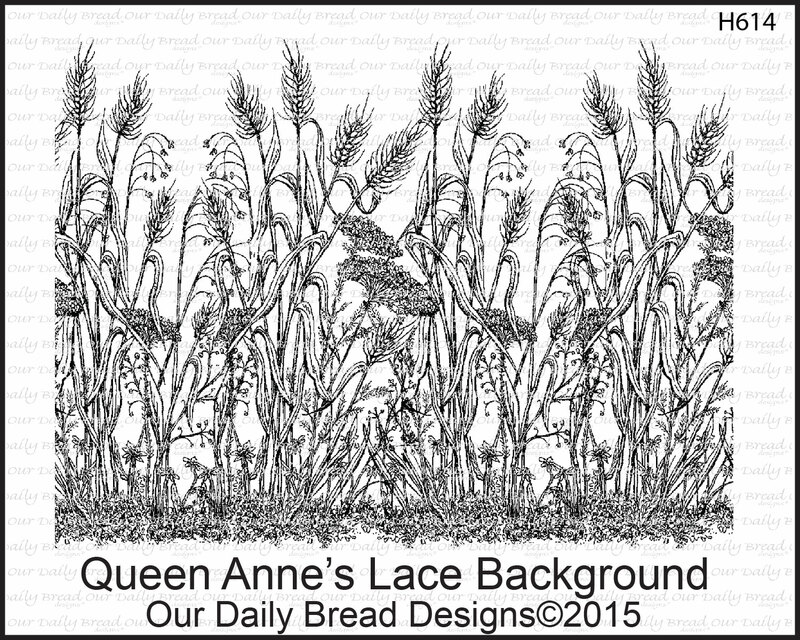 Little birds from ODBD Birdcage and Banner Dies. And a key from ODBD Angel Wings Dies. I placed these onto panels made with ODBD Faithful Fish Die and ODBD Flourished Star Pattern Die. 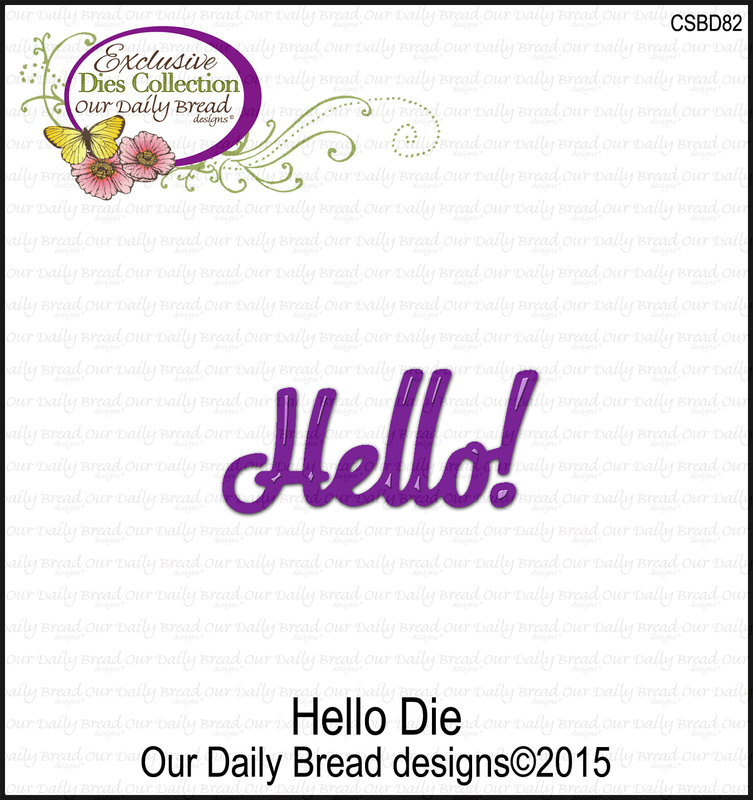 Then I completed it with a die cut with the new ODBD Hello! Die and a pearl for the dot! Looking Back at the ODBD February Release! I seriously cannot believe we are nearing the end of February already! It is full speed ahead isn't it??!!! 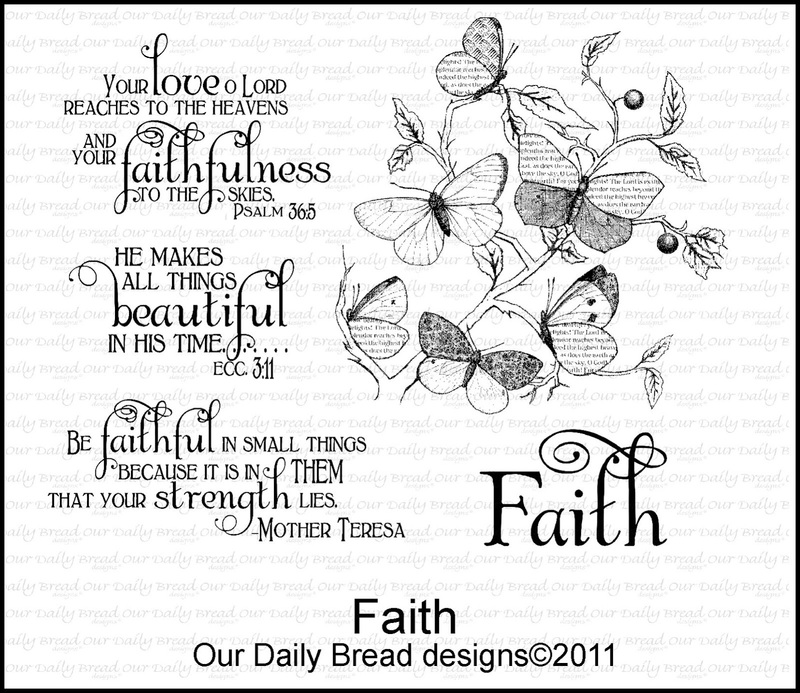 February releases from Our Daily Bread designs. My first card features Life is a Gift and Miss You. I also used the inner section of the Faithful Fish die using the de-bossing capabilities of the die. I layered this onto of another piece of ivory card stock cut out with the outside portion of the Flourished Star Pattern die. I added a Beautiful Border as well. 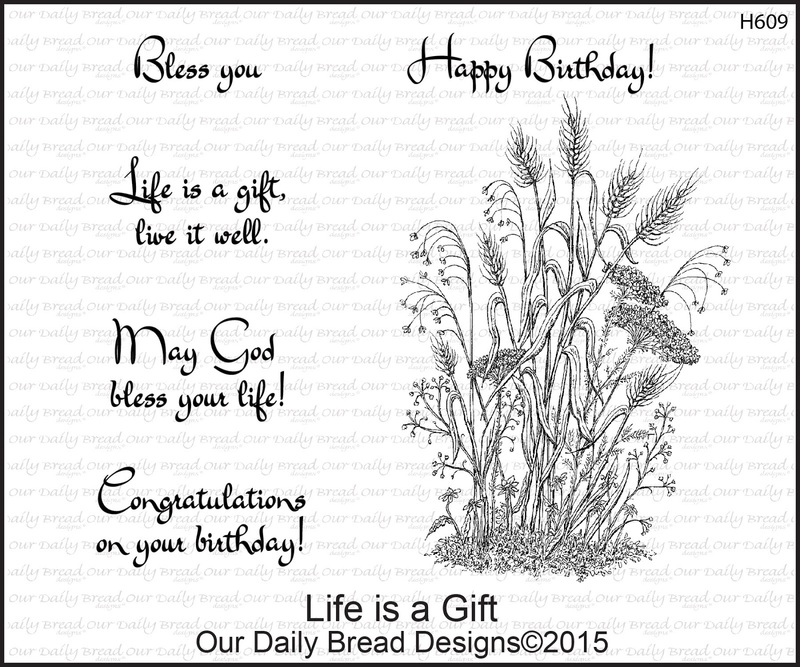 This card features Life is a Gift along with the new Happy Birthday die! 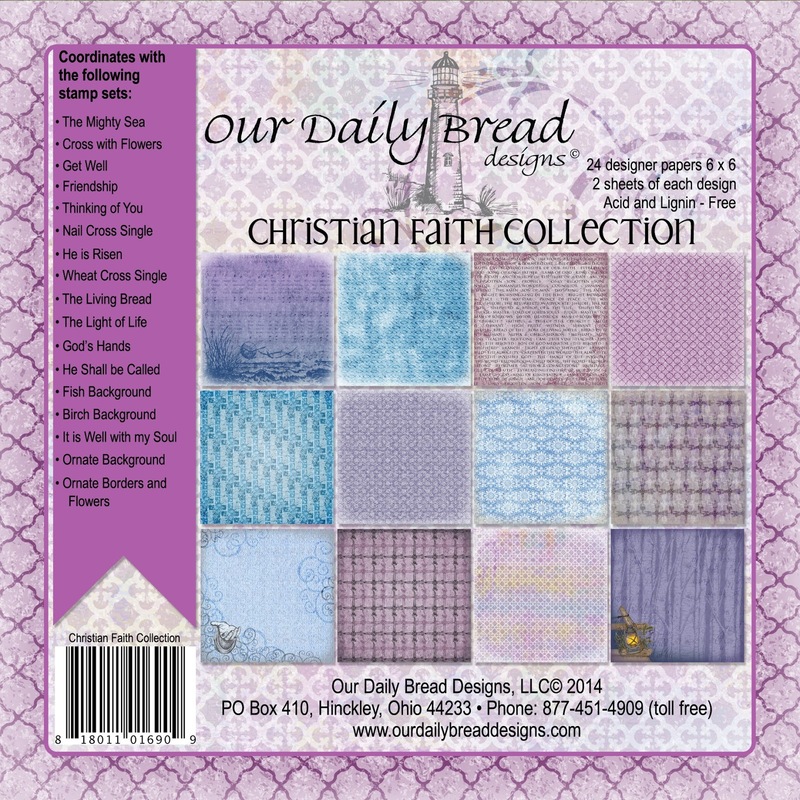 The patterned paper is from the ODBD Christian Faith Paper Collection. Thank you so much for visiting with us today! Welcome to the NCC February Release! 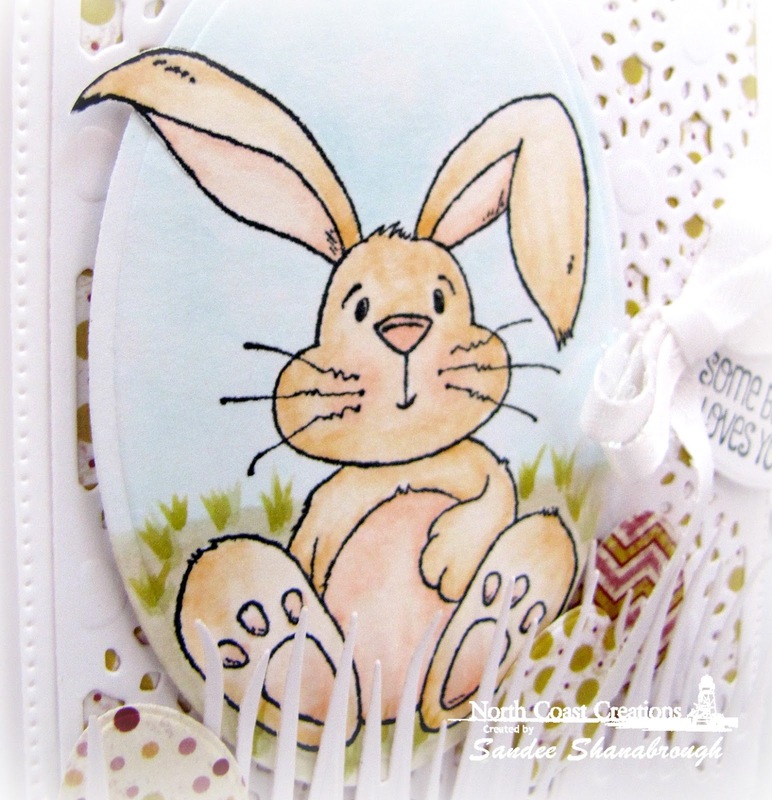 Just for commenting on the Design Team Blog Posts, you have a chance to win a $10 NCC Gift Certificate, good towards the purchase of NCC Stamps. You have until February 17, 2015 at 10:00 PM EST to leave a comments on the participating designers blogs for a chance to win! Two random winners will be selected from the comments left on the designers blogs, the winners will be announced on the NCC Blog on February 18, 2015, be sure to check back there to see if you have won! 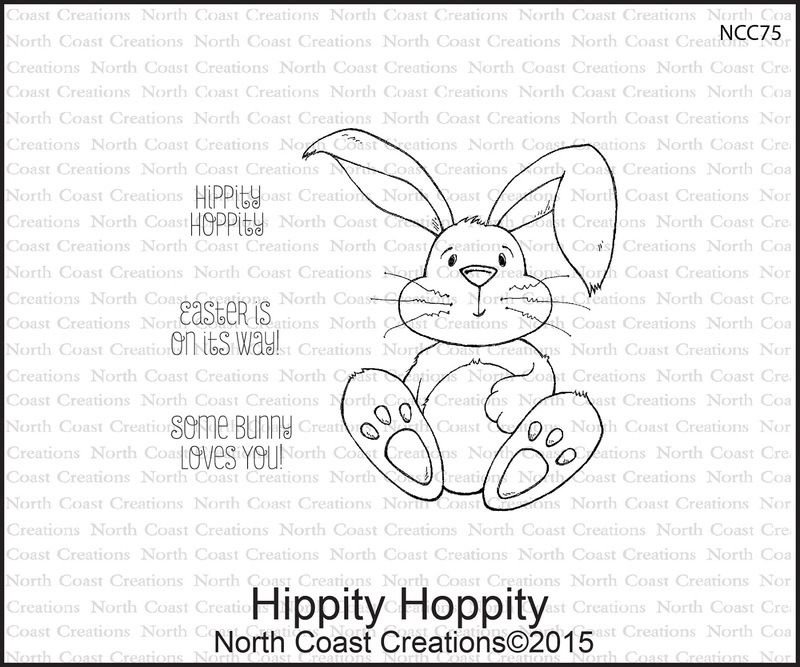 My first card features the adorable set called Hippity Hoppity! Isn't that bunny adorable? I had so much fun coloring him! 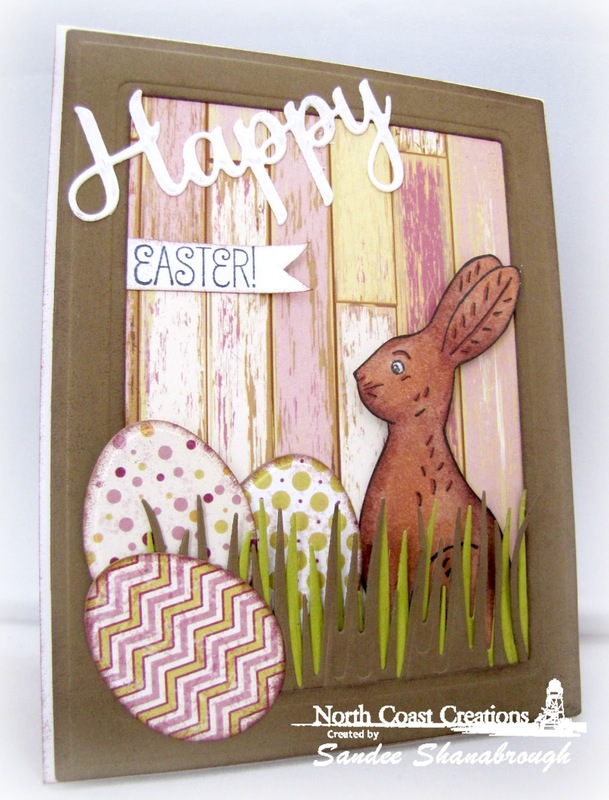 I used pieces of ODBD Rustic Beauty Paper in the background and for the little Easter eggs. 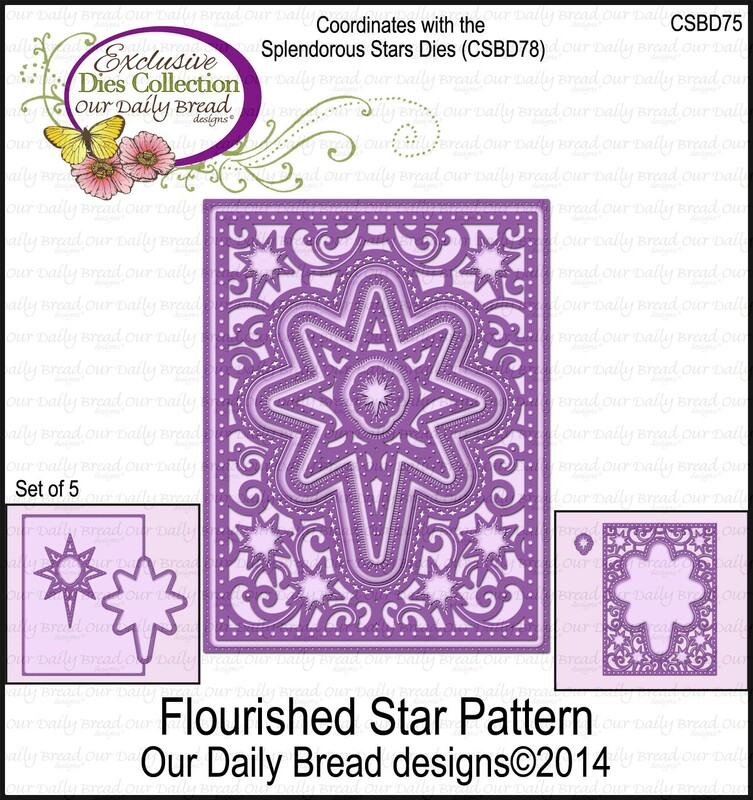 The background overlay is cut with the ODBD Daisy Chain Background and the outside edge is cut and embossed with the ODBD Flourished Star Pattern die. (Psst! The egg dies and the grass dies are a sneak of new products from ODBD coming soon!) And the tag is cut with ODBD Mini Tag dies! Oh my goodness! A chocolate bunny y'all!!! 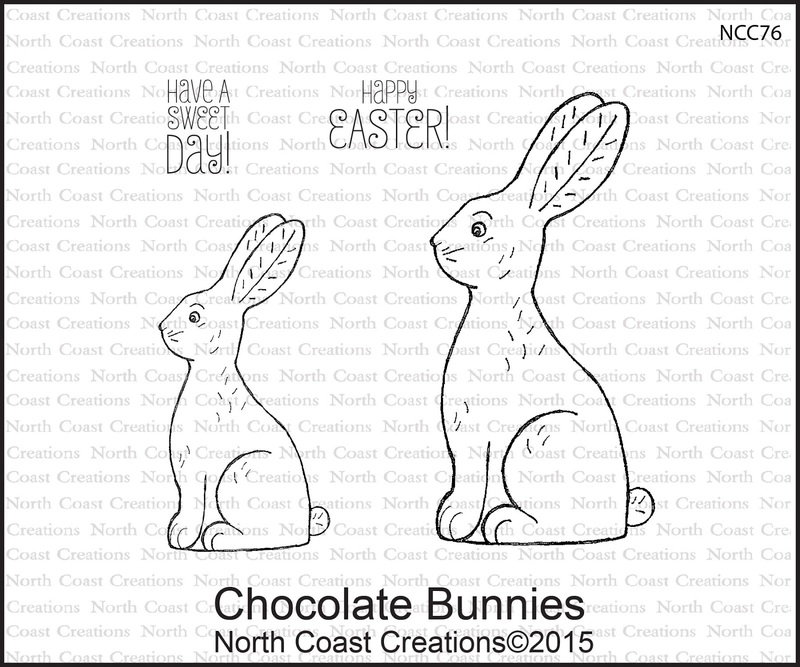 From the new set called, appropriately, Chocolate Bunnies! LOL! Another adorable stamp!!! After coloring him I cut him out and tucked him behind the grass, popping his little ears up a tad with foam tape. 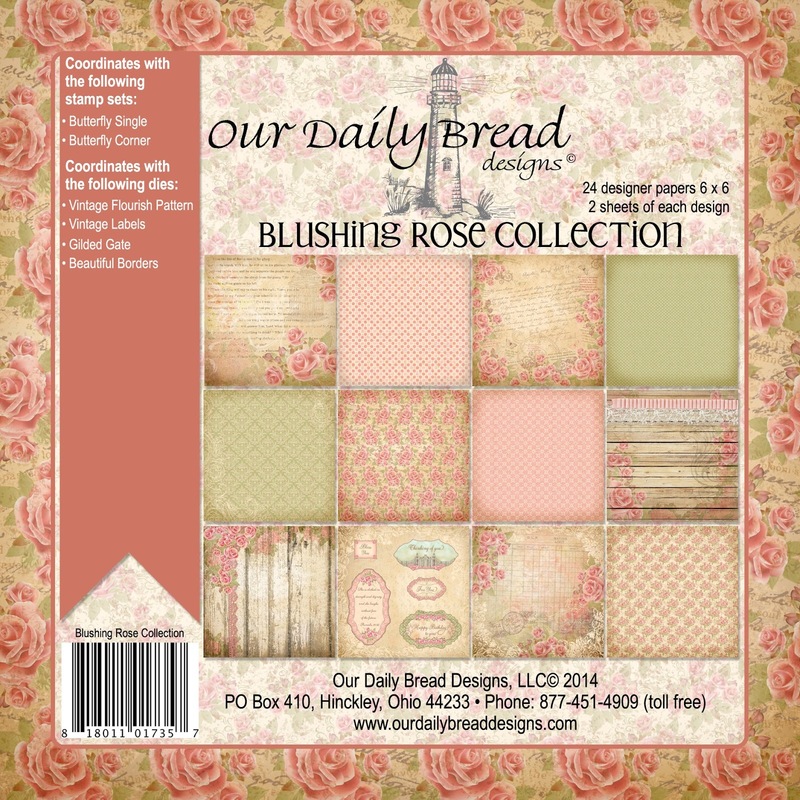 The designer paper is the ODBD Rustic Beauty Paper Collection. Some larger Easter eggs are tucked in as well. 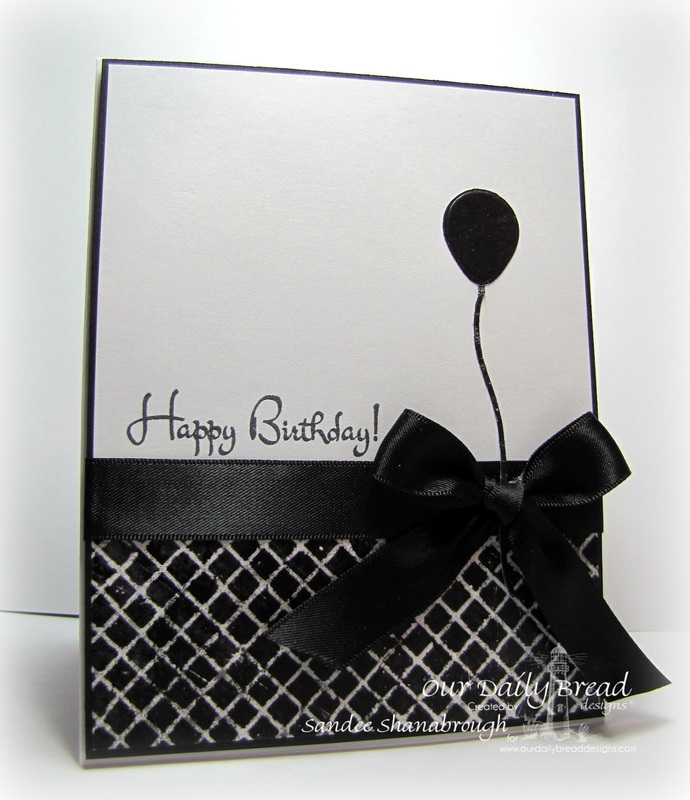 I masked the sentiment stamp so that I could use the Happy dies from the ODBD Happy Birthday die! Thanks again for stopping by! Have a wonderful day! Hi there! Hope you are having a great day! 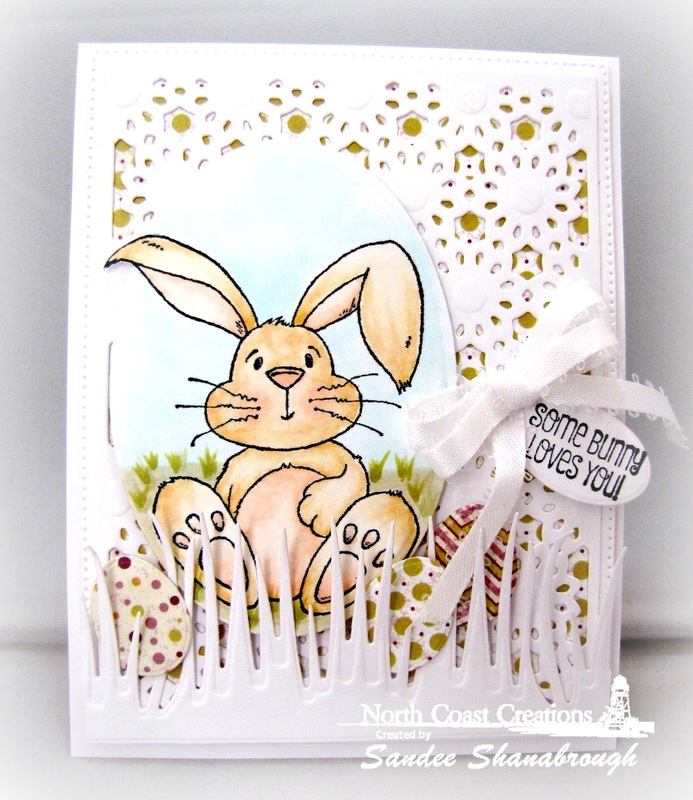 I played in the sketch challenge at Splitcoast this morning but didn't have time to blog it until now! 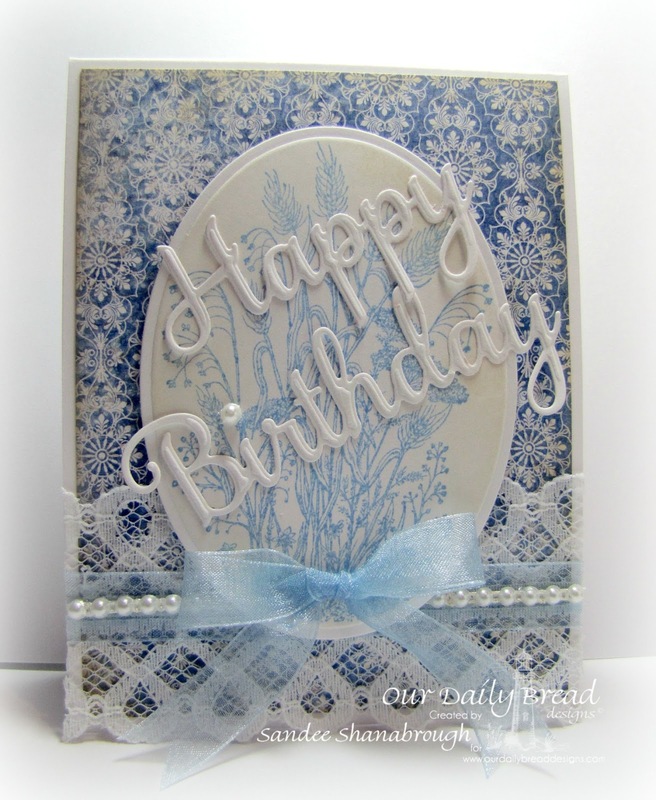 I used the new ODBD Queen Anne's Lace Background along with the birthday sentiment from Life is a Gift. 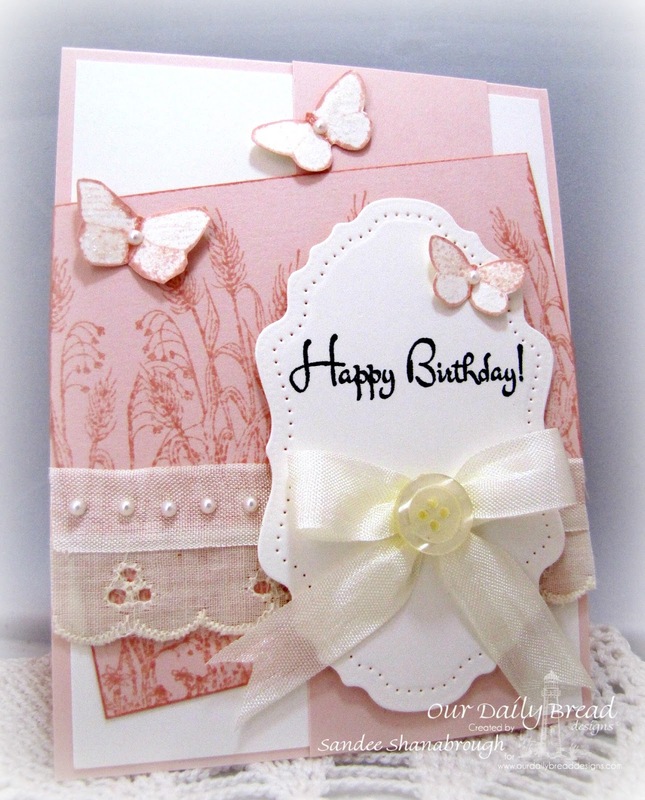 The butterflies are fussy cut and are from the Faith stamp set. 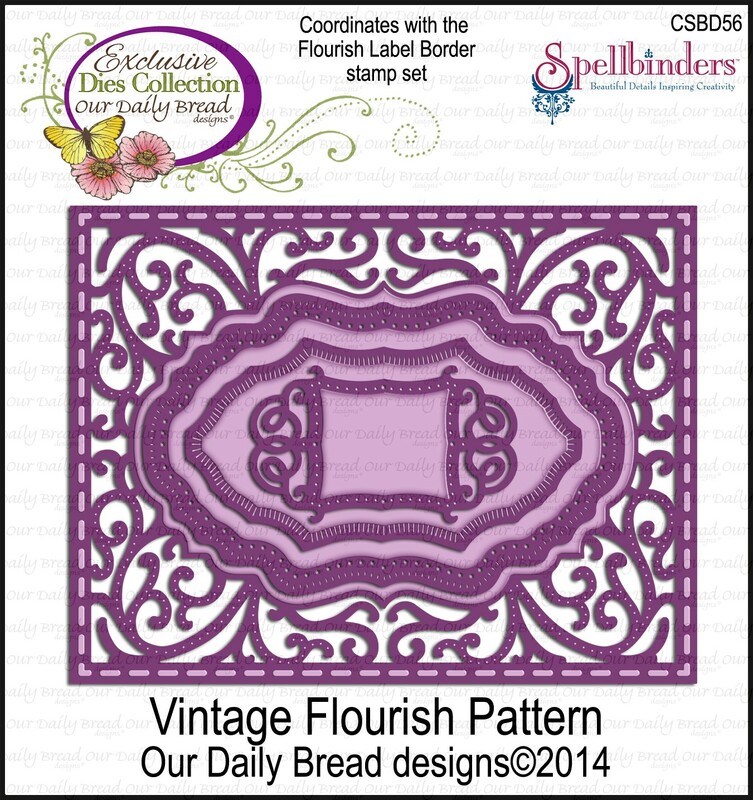 The die-cut is from the Vintage Flourish Pattern set. I really appreciate you stopping by today! Welcome to the ODBD February New Release!!! 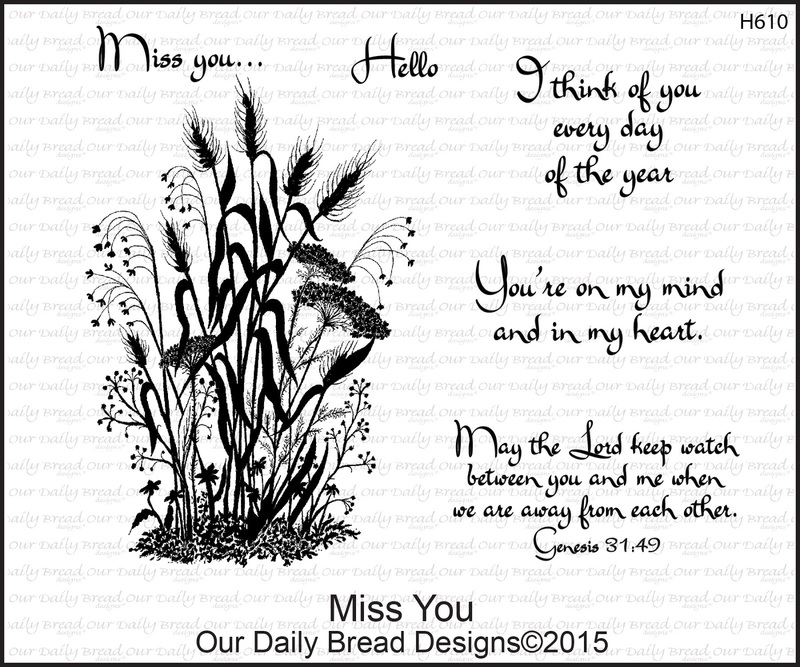 Welcome to the Our Daily Bread designs February release! We are so happy you joined us today! As always, you have a chance to win just by commenting! Three randomly selected winners will each receive a $25 gift certificate to the ODBD Store, to be used toward the purchase of ODBD Stamps found in the "stamps column" of the website just for commenting on the Design Team cards! You have until February 2, 2015 at 9:00 p.m. EST to leave your comments on the Designers Blogs for a chance to win! The Winners will be posted on the ODBD Blog on February 3rd, so be sure to check back there to see if you won! 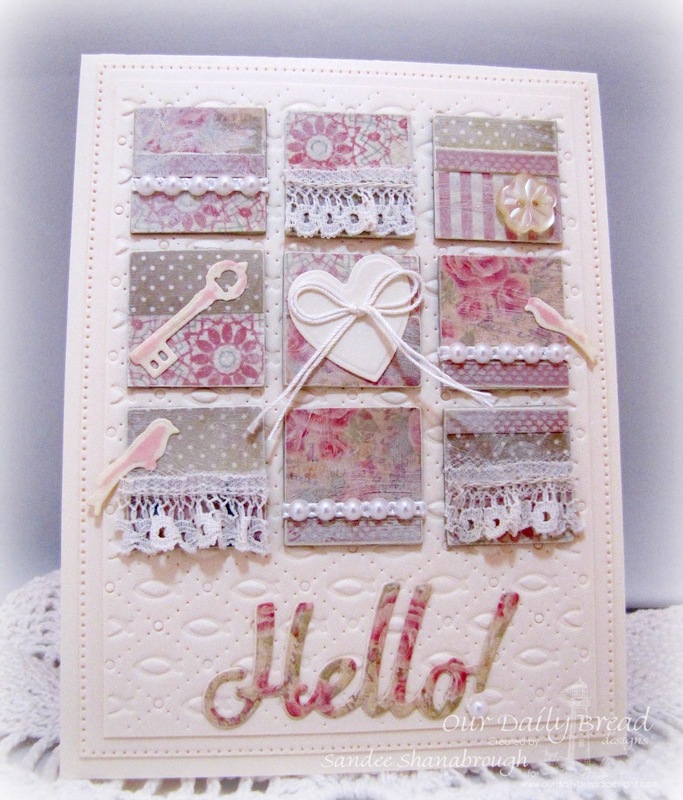 My first card features the new Hello Die along with a sentiment from the Life is a Gift set. 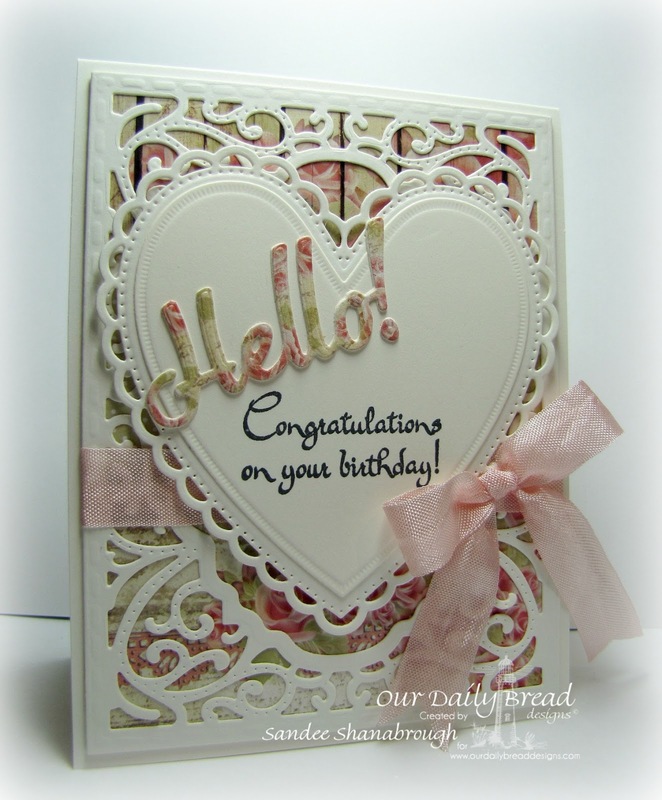 I used ODBD Blushing Rose Designer Paper for the word die cut and for the background behind the Vintage Flourish Pattern die and Ornate Hearts die. Are you just as excited as I am about the new words dies!!! Way to go ODBD!!! I think this would be fun for an 'over the hill' card! I used pieces of the ODBD Chalkboard Paper Collection on the cleans and layered card. 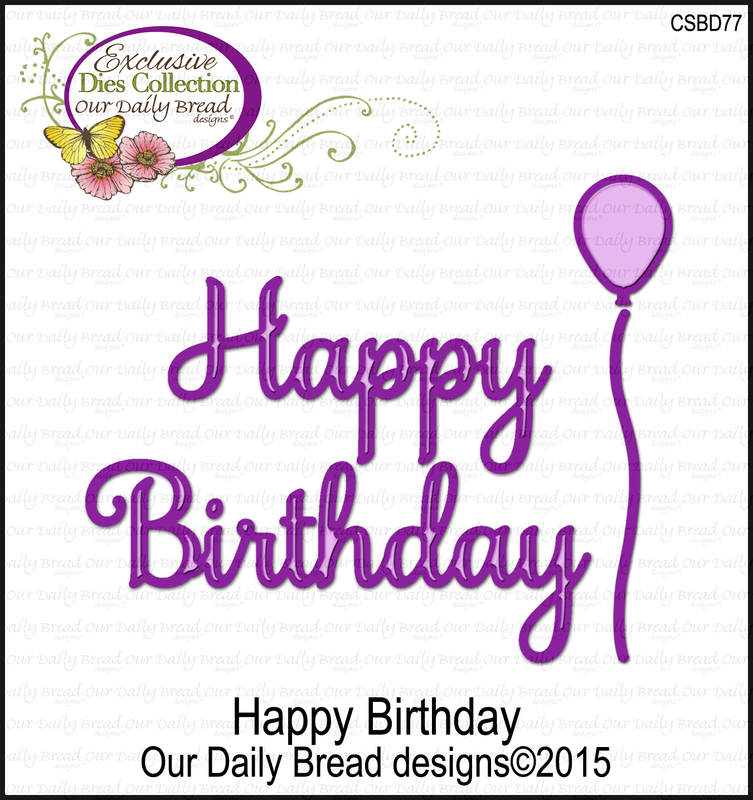 The balloon is cut with dies from the Happy Birthday Dies set. The sentiment is also part of the Life is a Gift set. that I sneak peeked the other day! That's it for me today! Don't forget to comment on all the blogs for your chance to win! head over to the ODBD Blog post HERE to get back on track! Thank you so much for stopping by! Have a wonderful week!